After spending an awesome night in Boulder, Adam and I kicked the driving part of the first week of our road trip into high gear. We had decided that we would take a detour North and aim to make it to Montreal by Friday to enjoy a weekend in the city before heading to the Catskills. This meant covering about 1,850 miles in three days, but we knew that we could do this without too much difficulty. Making that decision meant that we blew past many cool stops in the heartland. On Wednesday, we focused on leaving Colorado, crossing Nebraska (which seemed to take forever) and stopping for the night in Des Moines. About midway through Nebraska’s plains we were hit with some fairly crazy weather. This was the first of several rain showers we’d hit in the heartland, and the first time I’ve dealt with lightening and loud, booming thunder in a very long time. We slowed our driving speed considerably and I kept my eyes on the tail end of a big rig in front of me, praying more than a few Hail Marys. The Blessed Mother makes an excellent travel companion! 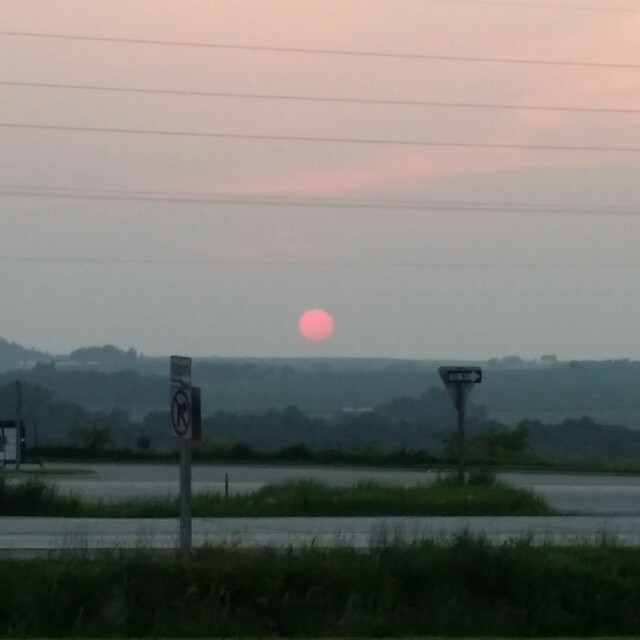 Sunset over Iowa, almost to Des Moines! Our stopping place for Wednesday was at the Microtel Inn & Suites by Wyndham in Urbandale/Des Moines. We arrived very late but were met with a front row parking spot and a very friendly staff at the front desk. The Microtel is extremely inexpensive, but I’d say that despite the lack of frills, this was one of our nicer hotel experiences. After checking in, we dined at the Chili’s next door and then Mom passed out while the teen went for a workout. I’d recommend this hotel for quick stops if you find yourself needing a stop along the interstate. Our destination for Thursday night was Flint, Michigan. With close to 600 miles to drive, we had time for only one quick stop. 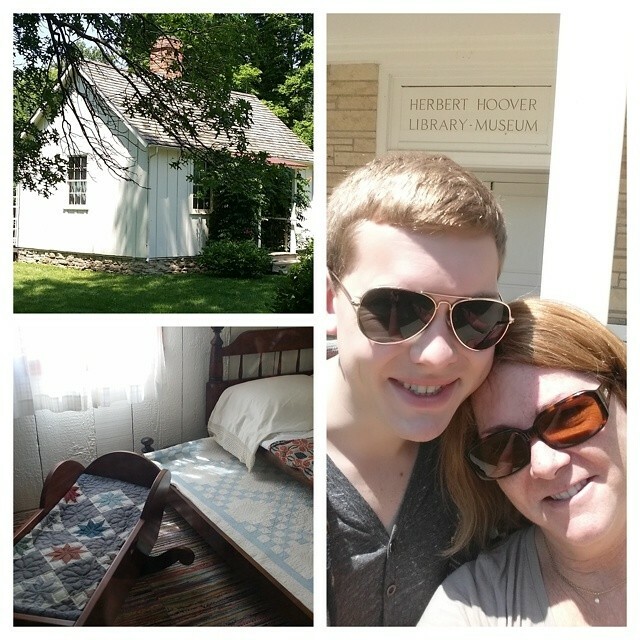 We spontaneously decided to make it a visit to the Herbert Hoover National Historic Site in West Branch, Iowa. Do we have a great fondness for President Hoover? No… but when I saw the signs it seemed like a good place to stretch, catch a bit of history and enjoy lunch. The historic site includes the Birthplace of Herbert Hoover, the Presidential Library and Museum, and Gravesite of President and Mrs. Hoover. While we didn’t have time to visit the exhibits in detail, the area was beautiful and felt quite historic. Lunch on the nearby main street of West Branch felt like a step back in time — we ate at a delicious cafe and loaded up on roadtrip supplies at the local market. I’d highly recommend a stop in West Branch next time you find yourself in Iowa! 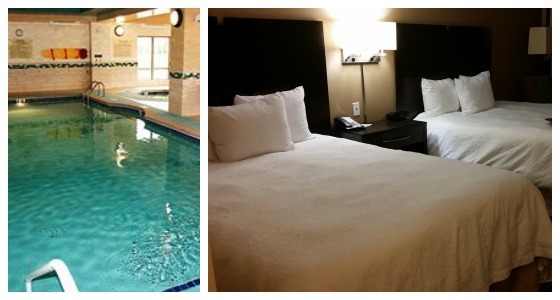 As we began to head North, we avoided the temptation to curve up to Chicago to see family and instead forged ahead to our hotel for that night, the Hampton Inn and Suites Flint / Grand Blanc. This was a truly wonderful hotel. After a couple of full days of driving with very little exercise, Adam and I took advantage of one of the hotel’s best amenities: its pool. I’ve been lap swimming, and it was incredible to have this beautiful indoor swimming space virtually to myself. Adam loved that the Hampton Inn’s fabulous exercise room was open 24 hours so that he could workout while I was using the FREE laundry room to do a few loads. I give this hotel high marks for being the type of lodging that truly could be a home away from home. And breakfast? Yum! If this feels like a relatively uneventful few days to you, perhaps you’re right — we didn’t see much except the beautiful views along the highway and a few stopping places for gas. But during these days, we began to experience the rhythm of what our trip would be like. I learned during this stint that the beauty of this adventure was not going to be the tourist stops (although those are fun), but instead what was happening inside the MINI. You can’t spend ten plus hours per day in close confines with another person without some pretty fascinating conversations. And to supplement all of the talk, we shared one another’s music (Adam’s Irish tunes and mom’s “Matt Maher Pandora Station”). We laughed at Netflix episodes of The Office (great for a road trip driver who can’t watch, because it’s so dialogue driven). We discovered carmel corn as our snack of choice. We laughed, we occasionally squabbled and teased, one or the other of us caught catnaps, and we laughed some more. Continue to check in regularly for additional installments my ongoing “Epic Road Trip” series. Next up: Montreal!